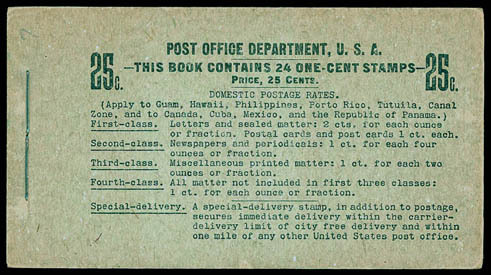 Booklet, 1903-07, 25¢, black on green cover, complete and unexploded containing four panes of six of 1¢ stamps (300b), position A, o.g., never hinged, firm uncreased covers with no usual rust affecting staples, panes overall centering a bit better than normally encountered, Extremely Fine and choice; with 2015 P.F. certificate. AN EXCEPTIONAL INTACT EXAMPLE OF THE 1907 25¢ BLACK ON GREEN BOOKLET. 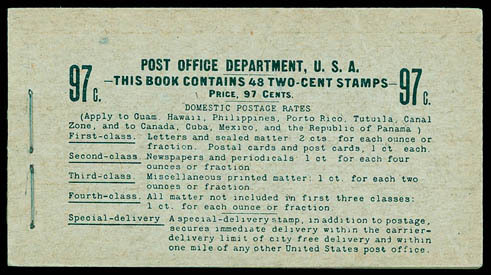 Booklet, 1903, 97¢, black on gray cover, type II lake panes, complete and unexploded containing eight panes of six of 2¢ stamps (319q), position E, o.g., never hinged, firm uncreased covers, panes overall centering a bit better than normally encountered, remarkable overall freshness, Extremely Fine; with 2015 P.F. certificate. AN WONDERFUL AND RARE INTACT EXAMPLE OF THE 1903 97¢ BLACK ON GRAY BOOKLET BEARING THE LAKE SHADE PANES.